School pictures: I framed them (in cheap, boring frames) and have them propped up at the moment. I need a plan of attack for displaying framed photos, but decorating is not my area of expertise or interest. Aldi (revisited): After additional shopping, I have determined that Aldi will never replace Wegmans for me. I have switched to Aldi diapers and other non-food items like garbage bags, toilet paper, etc. The produce is significantly cheaper, but selection and variety is limited and unpredictable. Things I have tried and rejected: cereal bars, granola bars, chocolate chips (nasty! ), and a frozen pasta meal. 365 Mile Challenge: I even logged my first bike miles of the year. Yay! Holidays: My son and I had lots of fun decorating for Valentine's Day. We've done some minor decorating for St. Patrick's Day (pictures will be shared in the March update), but I have been disappointed to find not much in the way of fun decor. The stores seem to have moved directly to Easter without much thought for St. Paddy's. 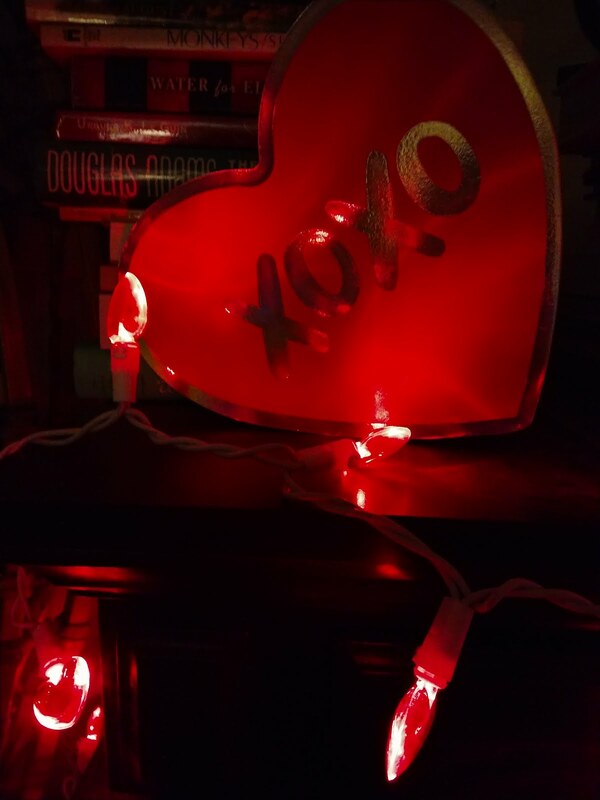 I was hoping to find a string of shamrock lights to replace the hearts below. Are the leprechauns going to come? No, I don't think the leprechauns are coming. I'm not that creative.